Teacher Burnout is Real. But Not Because of the Students. I’m so glad the semester is over. Yes, I have the usual complaints about too much grading, sickly students, and overall fatigue. But this year, this fall, my gratitude for a winter break has more to do with my emotional well-being than my physical. 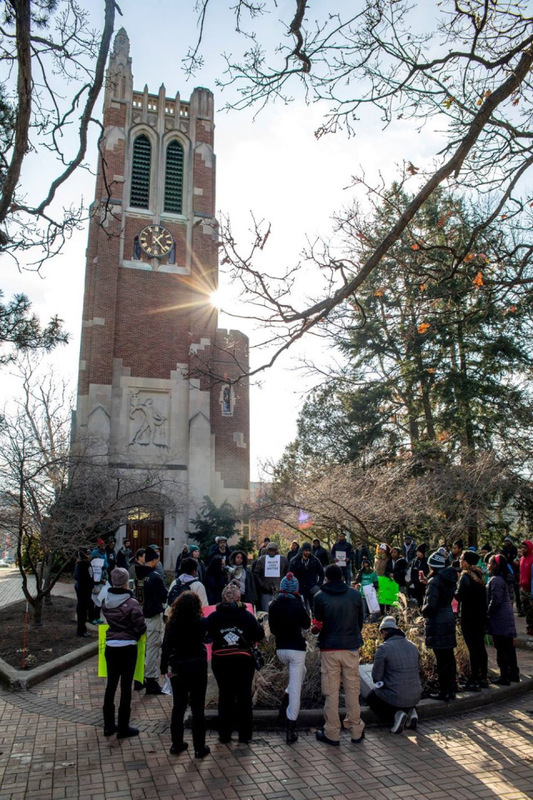 Like many campuses around the nation, my college was not immune to racial tension, student protests, and faculty ignorance. In fact, because we are such a small campus (only 2200 undergrads and approximately 180 faculty), these issues felt exponentially larger than they might have felt at my graduate alma mater, Vanderbilt University. On small campuses, the few people of color (student, staff, administration, and faculty) are highly visible. I can’t hide in my office. I can’t pretend to not know what’s happening on campus. I can’t feign ignorance of students’ emotional responses to hate speech because it would be more convenient for my professional and personal life if I didn’t have to engage such complex issues. I am on the Diversity and Equity Advisory Board this year. It’s my official committee assignment (which I chose after not winning enough faculty votes to be on our governing board or our curriculum committee). The work of the DEAB is still a bit nebulous, but one thing that is not included is educating my fellow committee members about why issues of diversity matter to everyone and should be included in our “strategic plans”. The chair of this committee is a white woman (not from the US) who’s been at the college for over 10 years. She is in the math department so in my naïve estimation, as a minority in her discipline I thought she’d have a better understanding of what our committee should actually be doing. I was wrong. I get it. I promise I do. But in that moment I wanted to scream. Again, to her credit, she looked as if she had an epiphany. Then she said that math and natural science professors have an additional hurdle because issues of diversity “don’t fit” into their content. I told her that as a content expert it is her responsibility to spend 20 minutes thinking about how she can integrate diverse perspectives into her curriculum. She admitted that she hadn’t tried to integrate; but she had tried to add in conversations about diversity. I told her that forcing students to read current events and having conversations about racism was a good first step, but that disconnecting it from course content reinforces the idea that these issues are ad hoc. That thinking and talking about marginalized people can come after you’ve done the ‘serious work’ of learning about limit functions. She pledged to try harder. I appreciated that. But then she did the one thing to which I’ve yet to develop a response: she asked to have more conversations with me about these issues because she wants to learn more. She quickly followed that request with a sincere acknowledgement that it was not my job to teach her and that I clearly have enough on my plate (she’d been reading about the burden faculty of color have with mentoring students and serving on every committee as the diversity representative). I assured her that if she wanted to brainstorm ideas for inclusive pedagogy, I would be happy to help. But I left her office worn out, a bit angry, and a whole lot frustrated. I was not and am not angry with her. I am actually happy she had the courage to have this conversation, admit her shortcomings, and ask for help. This is, after all, what I encourage my students to do in their learning processes. But for the first time ever, I’m tired of being the teacher. I haven’t written a blog post in a very long time. I created this blog to give myself a space to vent, think aloud, and sometimes solicit feedback from the internets when I needed guidance. But mostly, this blog is for me. So I don’t feel guilty having taken a few months (ok…more like 6 months) away from this space. I needed it. More specifically, I need time to wade through a new space in which I found myself last Spring and Summer. On the heels of a professionally challenging Spring semester I started a very demanding Summer. I had a grant proposal due on Aug 5th, needed to prepare my third year review file, was teaching 3 classes (2 concurrently), and had to write 4 chapters in my book if I was to stay on track with my publisher. In true Manya fashion, I had a schedule with due dates and a really solid plan for making sure that this would be a productive summer complete with scheduled time to celebrate my 30th birthday in New Orleans. Then the person I had been dating came to visit. And he got sick. And he was admitted to the hospital. And he died. All in a 5 week span. I’ve written before about managing my grief while trying to be a functioning academic. But this time it was so different. Losing my grandfather during my first year of grad school was hard but he a) was older and b) had cancer so it wasn’t a surprise. Losing my brother in my third year of grad school was devastating. But again, I can soothe myself when I remember that he didn’t really want to be here anymore. Last Spring I lost my best friend to complications associated with HIV. That hurt. A lot. He was young, he did want to be here, and so many people counted on him to be their light. Including me. But all three of those losses represented a loss in my history. These were people with whom I shared a piece of my past. My grandfather building a swing set and teaching my cousins and I about snapping turtles. My brother was the one who could always remember minute details from childhood experiences. My best friend was a reminder of how much fun I had in high school and how I started becoming the person I am today. But this most recent loss is all about my future. When you meet someone and you date them romantically you can’t help but envision what it would be like to really be with that person. You know, marriage, kids, all that. And even if you aren’t that deep into your relationship, you start to feel a sense of hope that maybe, just maybe this time, this is it. And you’re happy. Then he got sick. So sick he was bed ridden and not eating or drinking. I had to take him to the hospital 2-3 times a week to get fluids. He lost 50lbs in 3 weeks. I was his primary caretaker. I would wake up every 2 hours at night to check on him and make sure he was breathing. I lived in fear that when I came home from teaching a class, I would find him dead in my house. I was so relieved when I was able to get him admitted to the hospital because I felt like it was no longer my responsibility to keep him alive. The doctors and nurses were amazing. They did everything possible to figure out what was wrong. I was able to teach a 3-4 hour class and not have pressing guilt that if something happened, he would be alone. I was at the hospital by 7:30am every day. I left from 12:45-4:15 to teach. Then I went home at 9pm every night to shower and sleep and spend time with my dog. That was my life for 9 days. On day 9, he had emergency surgery that he pulled through by the grace of God. I called his mom. She came on day 10. On day 13, he was doing so great. He was up, walking around, talking, wanted to eat and drink for the first time in 4 weeks. I was elated. I was meeting with nurses and learning how to take care of him once he came home. I was making arrangements for rehab and physical therapy and thinking how I could change the bathroom so someone with a walker could move around. On day 14 he went back to ICU. He wasn’t oxygenating. He was septic. He had pneumonia. His kidneys stopped working. He died at 1:50pm on June 30th. I was holding one hand, his mother held the other. For 5 weeks I’d done nothing but worry about him. About Ron. Now, I had to worry about myself. My mother came the next day. People brought food. Mom made sure I ate. And then she left because life doesn’t stop just because you feel like it has. And I was left alone in my house for the first time in 6 weeks. I was in this new empty space alone. I kept on with my schedule. It’s all I knew how to do. I wrote, and went to New Orleans, and wrote and planned courses and slept. People checked on me. I was as okay as I could be. School started. I was finally able to see a therapist. I cried a lot. I stopped drowning myself in work and faced my grief. I went to visit my parents for a week. That helped. And now I’m in a new space. So many pieces of my heart have been broken by loss in the last 5 years, but I am finding that I have a lot of heart left. I was especially reminded of this when a student/mentee came into my office, sat down and said “You need to write a blog post. It’s been too long.” He even gave me an idea of what to write about. But more importantly, he gave me a reason to reclaim this space, this blog, as a space for myself that sometimes becomes a space for others as well. So no, this post is not about educational inequities or being a professor. It’s about being a person who is learning to take the space I need for what I want. Last week I attended the College Language Association (CLA) annual conference. It is a humanities conference primarily focused on Black/Diasporic language and literature. As an education professor, I was there because I was on a panel about a chapter I’d contributed to a book on Black masculinity. I didn’t know prior to going that CLA is basically a “Black” conference. The brief history I surmised is that it was created because MLA was not a welcoming space for scholars of color. I’m so glad I went because I needed that experience. I needed to be in a space with other scholars of color who care about the issues I care about and who experience the microaggressions I experience. Within 2 hours of my arrival, I met my panel organizer and editor of a soon-to-be published book entitled, Real Sister: Stereotypes, Respectability, and Black Women in Reality TV. She and I sat and talked for hours about our respective lives at our PWIs and in a community without other young professionals of color. She talked about not having anyone with whom to attend happy hour, see a movie or get afternoon tea. I talked about finally having a core group of friends after 3.5 years at my institution. I talked about the fact that beyond those 5 women, I too am alone in a city where the NAACP office was bombed a few months ago. I shared more with a woman I’d just met than I’ve shared with colleagues I’ve known for years. As the words poured out of mouth I realized the desperate need I had to share and to be valued and to have my experiences validated. Now that I’m back in Colorado Springs, CO I am reminded by the hour that this space in which I’ve chosen to exist will not listen to my voice; will not value who I am; will not validate my experiences. Yesterday’s faculty meeting was a smack in the face about the realities of what it means to be a Black woman under the age of 30 at a PWI. On the faculty floor was a conversation about diversifying the curriculum, born of a student initiated petition. It is important to note that their petition is not solely about diversifying the curriculum. On the contrary, the spirit of the petition is about honoring the experiences of marginalized people. They suggest we the faculty do so through our curricular and pedagogical decisions. Well sir, while you are basking in your privilege, others of us are living in marginalized bodies whose discriminatory experiences don’t end. Some of us don’t have the privilege of considering diversity an additive component of ‘real’ academic work because some of us embody what it means to be diverse. Some of us cannot shed our skin or hair, or change our sexuality or family background to suit your needs. I am sorry marginalized people—and our experiences—are an inconvenience to you. I am sorry that you having to read a few books and do some google searches and rearrange a week or two of your syllabus is beyond your mental and emotional capacities. Phew…just the thought of that much effort is too much for you, huh? Imagine how exhausted we the marginalized are when we have to rearrange our lives and our bodies to accommodate your white, upper middle class, English-speaking, male, heterosexual norms. Imagine how I feel when students storm into my office in tears because of something YOU said or did in class today. Imagine my surprise when students whom I’ve never even met seek me out as a resource because there are so few people who honor their existence and their experiences. These students are not only Brown or Black students. They are not only women (actually, most are male). And they are not only queer students. Or first generation students. Or low-income students. Or students with learning disabilities or psychological diagnoses. They are each a mix of those identity characteristics and their diversity speaks to the institution’s failure to meet the emotional and psychological needs of its students. Today a student of mine hit a crisis point in managing her mental illness. She’s been reaching out for the past week and myself and colleagues did the best we could to help. But she doesn’t feel that way. She feels abandoned. She feels thrown out and discarded by the institution. She sent me an email thanking me. Then she sent me an email informing me that she attempted suicide but was found by a cop. Today is a hard day for me. But it’s always harder for the students who feel unsupported and unloved. Let me be clear before I begin: this is not a post where I bash students. This is a post where I express my befuddlement of student decision-making. Some context: I teach a 300-level Educational Psychology course. It is required for the major and minor in Education and counts toward the Psychology major and minor. It is designed to be taken after 2 foundational education courses and one in-school practicum. I’ve taught this class (and a more rigorous version of it for graduate students) approximately 14-17 times over the last 3 academic years. It is indeed the course I teach most often. It is therefore the course for which I’ve received the most course evaluations. My average rating for this class is a 4.6 out of 5 (my average for other courses that aren’t as content heavy is a 4.9 out of 5). The course is usually at capacity with a small wait list. I often have 25 students in the class, save the last two times I taught it where I had about 17 students in each class. The mean and median grade in the course is always a B+…except for the last two times I taught it. These last two experiences were also different than the prior 12-15 experiences because sophomores (as opposed to juniors) constituted the majority of the student demographic. Educational Psychology, like most of my courses, is all about skill development. Thinking skills and writing skills. More specifically, it is about interpreting the content and expressing your interpretation in a comprehensible and supported fashion. My tag line for the course is “If you sell it, I can buy it.” The students come to understand that all I want them to do is adequately defend their beliefs. This involves a high level of metacognitive thinking, reasoning, analysis, and synthesis. It is the final two that trip them up. Students are so used to summarizing and describing, they have little experience with analyzing and synthesizing. They have been asked to share their opinions often, but they have not been asked to justify them in a scholarly manner. I therefore repeat the following phrase many times throughout the course: “I don’t care what you think. I care why you think it”. The assessments of the course are designed to measure their increasing cognitive skills. They are required to write reflections on course readings 5 times during the course (they choose which times) within which they synthesize 2 readings. The syllabus clearly states that these reflections are not a place to give their opinions of the readings. On the contrary, they are a place where they should discuss why different theories [mis]align with one another. They have a hard time differentiating this from comparing and contrasting. The reflections total 10% of their final grade. Other assessments include a 2-day/4 hour classroom observation of another college course where students must figure out how theories translate to pedagogical practice. They are asked to identify where they see theories ‘in action’ and analyze why a professor makes the pedagogical decisions they do. This assignment is worth 25% of their grade and occurs two thirds of the way through the course. Students are also alphabetically assigned to a small group (2-3) that presents an assigned reading for the day. The readings are theoretical reviews and are as short as 4 pages. Presentations last 45 minutes. This assignment is worth 10% of their grade and is the assignment on which they do the best. There is a final essay and a final exam for the course, each worth 25% of their grade. The essay is a persuasive essay in which students must advocate for or against a particular learning theory for a specific age group based upon their developmental capabilities. They are required to support their argument with 2 empirical articles. It is a 5-7 page paper due on the last day of class. The final exam is short essay (1 page per question) and contains 10 questions, each with different point values. Students are to choose 4 questions to answer. If they choose the four lowest valued questions and get them correct, their maximum score is 50 points or a letter grade of C. If they choose the four most difficult questions and get them right, their maximum score is 100 or a letter grade of A. They have 4 hours to take the closed-note exam. It is designed to be done in 1 hour. Phew. I say all of that because it is necessary context to understand the purpose of this post. This most recent time I taught the course, I had 4 students drop the class. Now, two of them dropped for medical reasons and went home for the remainder of the term. One dropped one third of the way through the course because he was failing and decided he didn’t need the class for his minor and saw no reason to get a low grade when it was unnecessary. A fourth dropped 85% of the way through the course because she didn’t want the low grade to lower her GPA. She plans to retake the class next fall. Two more students came to my office to tell me they too were considering dropping the course, but I managed to put the course in perspective and they stayed enrolled. What is stunning to me in this scenario are two things: 1) students even considering dropping a course as a viable academic option and 2) students dropping a course when they still have 55-65% of their grade unaccounted for. I know many people will read this and say it is my fault as the teacher that students are dropping. I disagree both on a personal level but more so on a pedagogical level. I contacted the students two months before the course began, shared the syllabus and communicated the level of rigor of a 300-level course, especially for sophomores. I shared with them my focus on skills, not content. I gave tips for how to prepare for the course. I provided all rubrics for all assignments before the course even began. Most of all, I gave clear instructions in a multiple of ways, many times. I answered every email inquiry within 12 hours and met with students before and after class to help craft outlines for assignments and to provide tips on how to read course texts. I also give extensive feedback on all assignments. All teachers want their students to do well and I am no different. But I also want my students to progress and actually acquire some skills they didn’t have before my course. I am less concerned with their final grade and more concerned with their final cognitive state. I monitor their progression via their reflections and pop quizzes (which 50% of do not count against students). I attend to their comments in class and their questions. I alter my daily lesson plans to address the gaps I see in their reflections. I am therefore stunned when a student comes to me expressing a desire to withdraw from a course before they’ve given themselves a chance to develop. This is especially ironic in a course about the learning process. While they clearly articulate their need to develop self-regulatory learning strategies, they are so in fear of failure, they do not give themselves that opportunity. It would’ve never occurred to me to drop a class in college. Once I was enrolled, I was committed. If I was not doing well in a course, I redoubled my efforts and if that didn’t work (and trust me, there were times it didn’t), I reconciled myself with the fact that I was not going to receive an A, A- or B+. While I of course blamed the professor for their alleged poor teaching/poor instructions/lack of feedback, it never occurred to me to do anything other than complete the course. I certainly would not drop a course when 2/3 of my points were still available. I like to think I have more confidence in myself than to quit 30% of the way into a process. But then again, I’ve always viewed learning as a process. I am not sure my students view it the same way. A process involves change over time. It requires adaption and reflexivity. A process is concerned with growth instead of the outcome. While I kept a keen eye on my GPA, I always measured my success by how much I determined I’d learned. And my learning was not restricted to content. In most cases, it was learning about my strengths and weaknesses as a student. I developed strategies and coping mechanisms when the content was a bit beyond me (hello, statistics!). If I ended up with a B- in a course (what’s up, Intro Psych?!?! ), I was proud of myself for figuring out how to get that grade instead of the C- I might have earned if I didn’t adjust my study skills. There has been a lot of chatter circling social media about the value of failure. Indeed, in my Ed Psych course we spend time discussing that very matter within the context of fixed versus growth mindsets and self-regulatory learning. We address it again during our discussion of motivation and self-efficacy. The students understand the importance of experiencing failure to cognitive growth. But they have a hard time feeling it. While only 1 student has ever truly failed this course (students view a B- or C as failing), I don’t want to be the professor who facilitates this type of experiential learning, but I see the value in it. Failure is where you experience growth. It is when you assess your decisions and their effect on the outcomes. It is when you learn how and of whom to ask questions. It is when you force yourself to be honest about who you are and what you are capable of doing. One must go through failure to develop the skills to get passed it. I am concerned we’ve established a system that facilitates students walking around it. Almost every Blackademic I know is figuring out how to address the reality that #BlackLifeMatters. Some are participating in local protests. Others are writing their political representatives. I am doing what I do best–teach. I am currently teaching a course entitled The Tradition of African American Education and the Black Bourgeoisie. While the title is long, it really embodies what I am attempting to do in this course. First, I want students to understand that education and schooling can and do look differently to different people. Second, I want them to recognize the purpose of schooling as determined by those for whom the school exists. Third, I want them to learn the history of education as dismissive, segregated, and unequitable. Finally, I hope they leave this course knowing that our current educational system insists on dividing people based upon social characteristics, and that sometimes, that division is positive. But I couldn’t do all of that without giving students historical and contemporary context, hence the inclusion of the Black Bourgeoisie. When it comes down to it, the Black Bourgeoisie was borne in concert with Historically Black Colleges and Universities because in the mid to late 1800s, one could not exist without the other. In fact, in the beginning, the Black Bourgeoisie defined themselves by their level of education and consequent professions. HBCUs in turn, defined themselves by the success of their alumni. For many decades it was a symbiotic relationship. And then came desegregation. I wrote a piece a while back that referenced what happened to the Black teacher work force when schools became desegregated. More than decimating the work force, desegregation whitened Black children’s education. Not only did Black children rarely see a Black or Brown face in their schools, they never saw themselves represented in their textbooks. The history of Black life was erased with the bang of a gavel. And we still haven’t fully rewritten the tale. But HBCUs remain storehouses of the Black narrative. There is where you find murals painted by Black hands; words written by Black authors; pictures taken of Black faces; conversations borne of the Black experience. HBCUs are where we find the history policies and people tried to take from us. So I decided to conduct my course off-campus, AT a Historically Black College or University. Fortunately, many members of my family attended HBCUs, my father works with HBCUs through his small business, and about half of my friends claim HBCUs. I therefore was able to make an informed decision about the best place for my students to engage Black history and Black life: Fisk University. If you’ve never heard of this school, do yourself a favor and look it up. If you are nodding your head affirming my choice of Fisk, I am nodding back at you. In only 72 hours, my students have experienced more than I can give them in a traditional on-campus course. We are living in Fisk dorms (yes, me too). We are eating in Fisk’s dining hall. We are attending Fisk events. We are visiting Fisk classes. We are meeting Fisk people. My students are also spending time at Tennessee State University. I wanted to create a multi-perspective course so I was fortunate that TSU and Fisk are neighbors, and that both were willing to partner with me in this endeavor. While we live at Fisk, we will be taking classes, sitting in on club meetings, and attending other events at Tennessee State University as well. My students have Fisk and TSU student hosts whose academic and extracurricular schedules they will follow for two weeks. Another week of the course is spent in coursework with me. We began this morning by participating in the annual MLK march in Nashville. Tomorrow is when we start to review texts by E. Franklin Frazier, Carter Woodson, and Lawrence Otis Graham. Class also includes heading 3 hours west to Memphis to visit the Civil Rights Museum before spending the following day at the public library in the Civil Rights Room. My class is where they will be held accountable for the synthesis of experience with content. After class is when I treat them to lunch or dinner at a variety of restaurants, all serving soul food. I have no idea how this is going to go. I can tell you that it’s 9:09pm on Day 3 and I am exhausted. We are settling in, making friends, and preparing for what should be a life changing experience. Just as all learning should be. These words could’ve been–have been–words I write, think, and feel everyday. We stand with you, beside you, and for you. Today is a hard day. I, like most Black people, am unsurprised at the news that Darren Wilson was not indicted. But that doesn’t stop my sadness. Or my hurt. Or my frustration with being part of a system in which someone’s fear is valued more highly than someone’s life. I am frustrated because I want to do something, but am uncertain what to do. I want to say something, but I am uncertain of what to say that could ease a miniscule amount of the pain ripping through the Black community. So as I wait for the words to come, I remember a time when I found my voice. When I was somewhere around 7 years old, my brother and I were part of a gifted and talented poetry class that met before school in the mornings. I don’t have a ton of memories from that time in my life but I do remember two things very clearly: 1) we read only poetry by Black poets and 2) I fell in love with Langston Hughes in that class. At such a young age, I think I was drawn to the iambic pentameter of the poem. I remember bouncing up and down and reciting it over and over. Even today, I remember how proud I was that I’d learned this poem, not knowing the lasting effects that experience would have on me. Fast forward to middle school when we were doing the traditional American public school nonsense surrounding ‘Black History Month’. One of the options for a ‘Black History Project’ was to do a research paper on a Black author. I recalled Langston Hughes from my childhood and chose him. This is when I encountered a poem that would forever change how I viewed myself as a Black person: “Mother to Son” by Langston Hughes. Well, son, I’ll tell you: Life for me ain’t been no crystal stair. It’s had tacks in it, And splinters, And boards torn up, And places with no carpet on the floor — Bare. But all the time I’se been a-climbin’ on, And reachin’ landin’s, And turnin’ corners, And sometimes goin’ in the dark Where there ain’t been no light. So boy, don’t you turn back. Don’t you set down on the steps ‘Cause you finds it’s kinder hard. Don’t you fall now — For I’se still goin’, honey, I’se still climbin’, And life for me ain’t been no crystal stair. You can imagine that at 11 years old I didn’t really get it. But in the midst of my research I learned a lot about slavery, the Civil Rights Movement, and Jim Crow. This was also the time when the Million Man March was happening in Washington, DC and my dad let me and my brother stay home from school (he also made us write a paper on the importance of this march which, in the eyes of an 11 year old, was of course worse than going to school). I remember auditioning for the recitation of “Mother to Son”, but being advised to instead participate in “Ego Trippin”. I took the suggestion well and was rewarded with an introduction to Black women poets. I spiraled out from Nikki Giovanni (after purchasing and voraciously reading an anthology of her work), reading poems by Maya Angelou and Audre Lorde. I let their words inspire mine and slowly, I found my voice. While my poetry was adequate at best, my prose was becoming stronger. I wrote every story, every school paper, and every note to my friends with a tone of authority and confidence. Having always been an avid reader, I worked on becoming a critical reader. What was the author really talking about? How did they orient themselves within the context of the piece? Why are these sweet lyrics being presented with strong dynamics? What do people see or think or hear when I speak? I looked for myself in every word. When I couldn’t find myself, I rewrote it to suit my needs. When I went to College, I knew I wanted to be an English major. I thrived in a department with small, discussion based classes where we read and wrote about a book per week. I learned to adjust my more flowery and esoteric English writing to fit better within more concise and precise Psychology frameworks. I wrote with both hands from two lenses. I wrote my feelings while also examining my thoughts. It was cathartic. I went to grad school and wrote on behalf of other people. I gave voice to marginalized families who felt they couldn’t speak on behalf of their own children. I became an Education professor. I cultivate student voice, both written and oral. I encourage receptive, procedural and expressive skills because if my students can’t or don’t speak for themselves, someone will speak for them. I created a blog. For myself. To work through the complexities of my identities and how they created my presence. I struggle every day with how to best serve this world. I sit in the wake of a series of political and racial injustices and find it difficult to locate my voice. I open a blank document and just start typing thinking that saying something is often better than saying nothing. Then I remember the 7 year old girl with glasses and crooked teeth who found her voice on a page of poetry. ~Langston HughesI, too, sing America.